Prepare for a sensational experience. Dr. David B. Axelrod served as Suffolk County, Long Island's Poet Laureate, before moving to Daytona Beach, Florida. Dr. Axelrod has published twenty books of poetry in addition to hundreds of essays and articles. He is the recipient of three Fulbright Awards, including his being the first official Fulbright Poet-in-Residence in the People's Republic of China. "Here's a rich feast and some high-octane fun for anybody who loves cars and racing. Not only is David B. Axelrod one of the nation's best poets, he's a strong contender for the title, 'Most Entertaining.'" -- X. J. Kennedy, poet, author, editor. 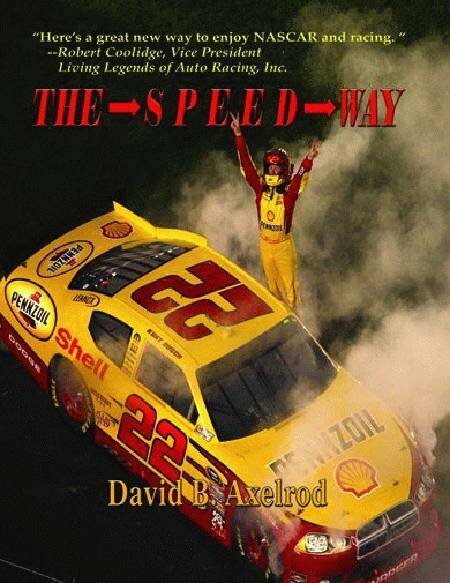 "A fine blend of NASCAR elements -- the history of the sport, the personalities of the drivers, details of the mechanics, the rules of racing, the perspectives of fans, the contemporary, social position of NASCAR -- and personal poems revealing a knowledge that adds authority to the poetry." -- Edward Byrne, poet and editor, Valparaiso Poetry Review "I'm not much of a poem person but these sounded like short stories to me and I thought they were very good." -- Bonnie Allison Farr, Bobby Allison Racing, Inc. "Great poetry, well-targeted to its audience. I like the way it captures the flavor of the sport and I particularly like the historical and biographical knowledge Axelrod gives the reader." "Whether Axelrod is reliving a moment of pleasure, or a time of bitterness and pain, the truth of his poetry is like life itself -- compelling."